My husband and I are both big baseball fans. It was the first thing we connected on when we met, and most of our first dates involved baseball games or baseball conversations. I remember wondering at some point if we'd ever have something else to talk about. Luckily for us, we eventually found more in common or it would have been a pretty boring marriage from the end of the World Series until Spring Training every year. When you're a baseball fan, the stretch between the end of the World Series and the start of a new season can feel really long, especially as spring approaches. If you are true nerd, like me and my husband, you get a little jump on the season by watching some of the spring training games. As far back as I can remember, the first official spring training game every year has been between the Red Sox and Twins, and it's become a little tradition in our house to watch both our teams as they gear up for the regular season. I definitely make more of a deal of this than my husband, but we both feel a little bit of celebration in the air as the first game approaches. 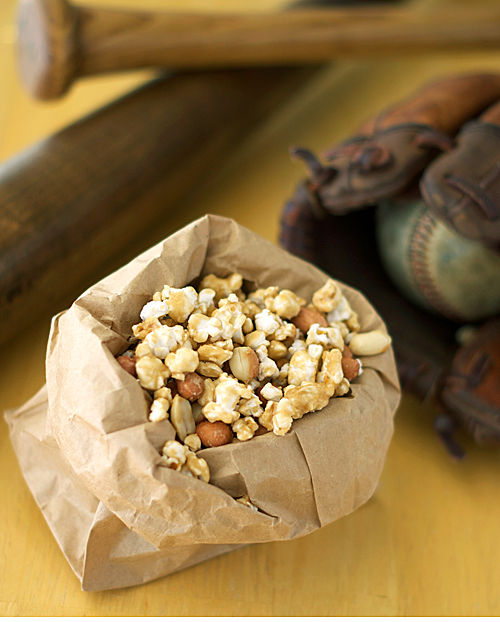 This year, to celebrate the occasion, I decided to make homemade Cracker Jacks. The problem that I found when taste testing the first results with my husband was that we aren't all that fond of Cracker Jacks. Caramel popcorn with peanuts? Big fans. Strongly molasses-flavored caramel popcorn with peanuts? Not as much. The recipe I'm sharing, then, is the perfect caramel popcorn/peanut treat according to us. It has nice crunch, great buttery, caramel flavor and salty roasted peanuts. I have honestly made four batches of it in the past week and it disappears within a day every time. I'm fairly certain my husband has eaten nothing else for days. (Remind me to schedule his next dentist appointment soon.) If you are celebrating the start of baseball season, need a gift for a neighbor, a treat to share with friends or just want to relax with a treat at the end of a long day, this caramel popcorn is the perfect special treat. Place the popped popcorn into two shallow greased baking pans. You may use roasting pans, jelly roll pans, or disposable roasting pans. Preheat the oven to 225 degrees F. Combine the brown sugar, molasses (if using), corn syrup, butter and salt in a saucepan. Bring to a boil over medium heat, stirring enough to blend. Once the mixture begins to boil, boil for 5 minutes while stirring constantly. Remove from the heat, and stir in the baking soda and vanilla. The mixture will be light and foamy. Quickly stir in the nuts and immediately pour over the popcorn in the pans and stir to coat. Don't worry too much at this point about getting all of the corn coated. Bake for 45 min - 1 hour, removing the pans, rotating them, and giving them each a good stir every 15 minutes. Test a cooled piece of popcorn after 45 minutes and if it is crunchy you can stop baking. If it is still chewy, bake for another 15 minutes. Line the counter top with waxed paper. Dump the corn out onto the waxed paper and separate the pieces. Allow to cool completely, then store in airtight containers or resealable bags. My husband and I are huge baseball fans too - in fact it was one of the first things we asked each other since we are from Chicago - Cubs Fan or White Sox Fan? Thankfully the stars aligned and we are both Sox fans. :D I'll have to make this for the first game - looks delicious Nicole! This recipe looks great, but I just have to say, your photography is beautiful! Great attention to detail with your use of props :) I could learn a lesson from you! I love that you both are baseball fans, too, and how lucky that you both liked the same team. Are you going to miss having Ozzie quotes this year now that he's with the Marlins? adding these to my MUST MAKE list! yum!! Mmmm, I love caramel corn! 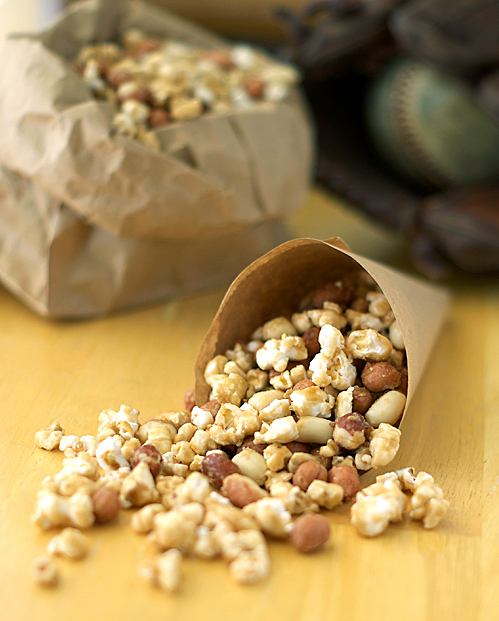 I have to say I like cracker jacks too, but I think your recipe is probably way tastier :) Putting it in paper bags is such a cute idea too! LOVE these, such a cute idea with the bags! i love homemade versions of things. this is awesome... caramel corn is sooo addicting! This looks fabulous, Nicole! Caramel corn is one of my favorite snacks and yours is just perfect. I adore the baseball backdrop, too. Very cute! Love this! I might have to make this with my nieces.